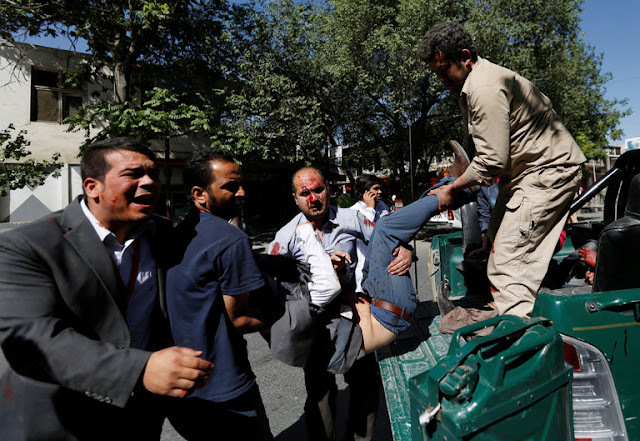 Home / #Car / #TrueNews / Afghanistan / Blast / Blasting / IS / ISIL / ISIS / Terrorism / #BreakingNews : At least 24 people were killed and 42 others wounded by suicide car blast in Kabul,Afghanistan. #BreakingNews : At least 24 people were killed and 42 others wounded by suicide car blast in Kabul,Afghanistan. At least 24 people were killed and 42 others wounded as a result of a powerful suicide blast in the limit of 3rd police district near to Deputy Chief Executive Officer (CEO) Hiji Mohammad Mohaqqiq’s house on Monday. The attacker detonated a bomb in his car in a mainly Shia neighbourhood in the west of the city, the official said. The target of the attack was not immediately clear, and there has been no claim of responsibility. The blast struck a bus carrying employees of the mining ministry. Police cordoned off the site of the explosion which is located near the house of deputy government Chief Executive Mohammad Mohaqiq. A spokesman for the politician told news agency AFP that "we assume the car wanted to target Mr Mohaqiq's house but was stopped by guards". No militant group immediately claimed responsibility for the blast. Past attacks have been attributed to either the Taliban or to so-called Islamic State. Kabul has seen a string of recent attacks, including a truck bomb which exploded in May, killing more than 150 people. According to the United Nations, the country has seen at least 1,662 civilian deaths in the first half of the year with around 20% of those in the capital. Najib Danish, spokesman for the Ministry of Interior (MoI), told Pajhwok Afghan News the suicide car bombing took place at 7:00 am this morning. Three vehicles and 15 shops were destroyed in the blast. Earlier, The Ministry of Public Health (MoPH) said five bodies and 15 injured had been evacuated to different hospitals. Pajhwok reporter Daud Mohsani said the early morning blast happened near Zawal University between Dihbori square and Golae Dawakhana. He said a white color corolla vehicle was parked near Mohaqiq house in the area which was exploded after few minutes.